15.2ch RCA pre-outs and 15 pairs of speaker binding posts -- including 8 total height speaker outputs (with Height4 pair assignable to Front Wide). The above facilitates the ability to run BOTH a 13ch Auro3D setup and a 13ch (9.1.4 / 7.1.6) Atmos setup without having to ruin positioning for one or the other. 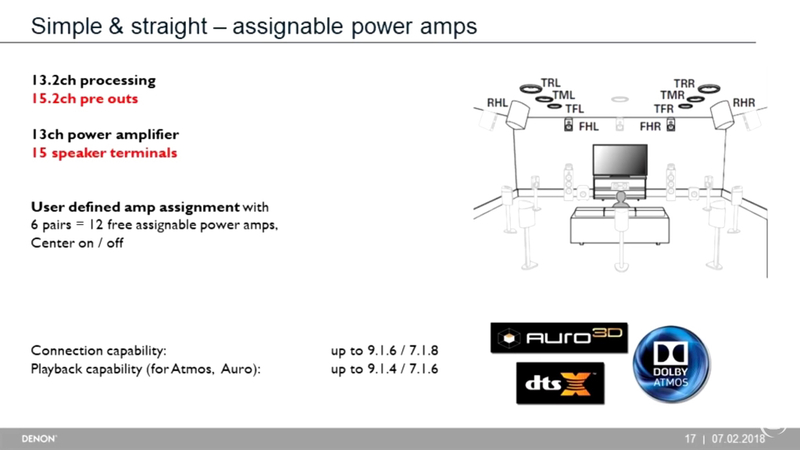 Because there are FOUR pairs of height speaker outputs (pre-out and speaker posts), with flexible assignment (including being able to assign Height4 to Front Wide output) you can do a complete Auro3D setup with five heights + VOG and still have another pair of height outputs for Top Middle or Front Wide use with Atmos. OK, I'm not going to do more than 7.1.4 Atmos. What else does this offer vs. the cheaper X6400H? Even if you don't go beyond 7.1.4 Atmos, the X8500H has significantly better Auro3D support (and also less compromise with a dual use Atmos/Auro layout). 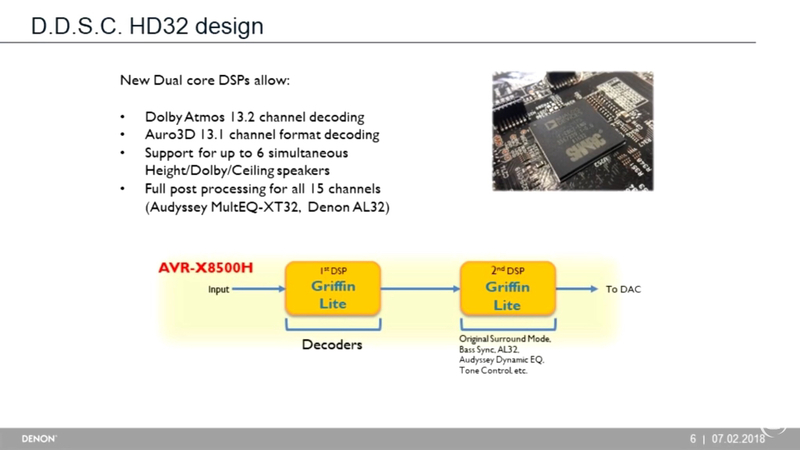 The X6400H like other previous 11ch D+M models is limited to 10.1ch Auro3D (5.1 + 4 heights + VOG). And the only way to practically mix Auro + Atmos is to use a Front Height + Rear Height layout. The X8500H can run a full 13.1ch Auro3D speaker layout and has FOUR pairs height speakers outputs, allowing you much more flexibility to configure your layout while maintaining optimal Atmos/DTS:X playback. X8500H also has a "Custom" amp assign setting which allows you to map virtually any speaker binding post to any channel of output. For example, if you're using a 5ch amp to power LCR+Surrounds in the main zone, you can repurpose the unused FL/FR and SL/SR amps in the AVR to power Zone 2/3 speakers (the X6400H only has predefined templates for amp assign). 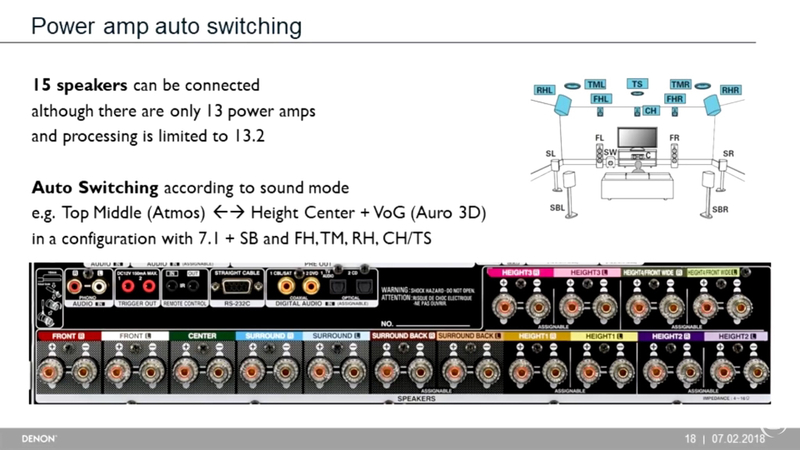 The X8500H also has a "pre-amp mode" which disconnects the amp section. 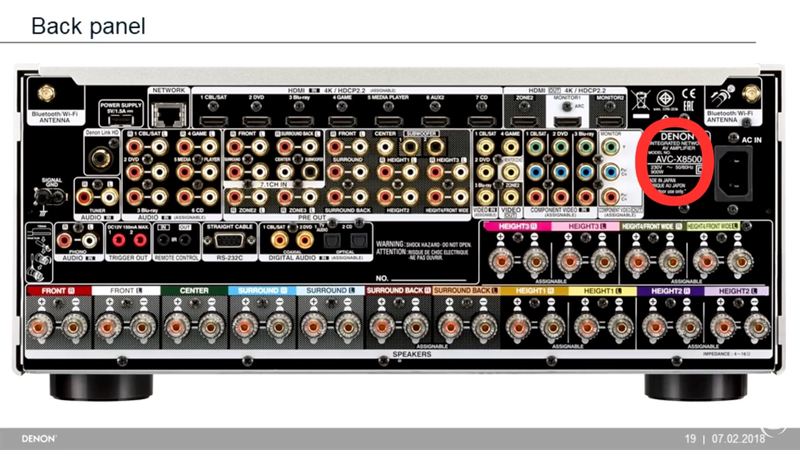 7.1ch multi-ch analog audio inputs, extra (3 vs. 2) component video inputs. 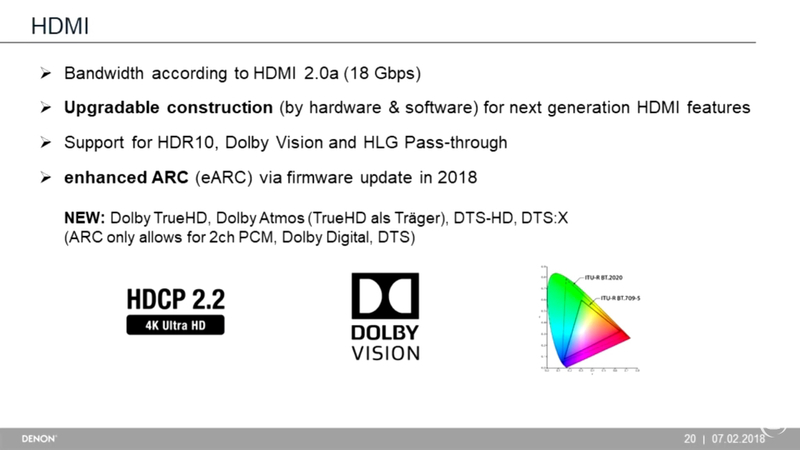 Future HDMI 2.1 hardware upgrade to increase lifespan by supporting 8K resolution and more (the same way they offered the "A" upgrade to the 7200/8802 for HDMI 2.0 in the last generation). X8500H has a rear USB input in addition to the front USB, the rear port is rated to power devices so more practical for a streaming stick or cooling fan etc. The X8500H has a nicer remote with "learning" capabilities to copy IR commands, macro capabilities, and also a "Remote ID" setting so you can prevent conflicts with other Denon device remotes accidentally changing it. Spizz, gene4ht, KidHorn and 12 others like this. Last edited by batpig; 02-16-2018 at 09:17 AM. - Audyssey MultEQ Editor iOS/Android phone app ($20) - (first introduced for use with the 2016 models) using the Audyssey mic included with the AVR, provides the ability to customize target curves, save them on the phone/tablet and send back to the AVR as needed generally only taking about 90 seconds). - The HEOS module will allow streaming the (currently) 12 music services using the HEOS iOS/Android app to the AVR as well as allow streaming 2CH sources (PCM 2.0 from HDMI/optical/digital coax/analog) connected to the AVR to one or up to 32 HEOS wireless speakers placed around the home, up to 16 of which can be grouped together for whole house audio with up to 8 independent sources. Additionally 2 speakers of the same model (eg. HEOS 3 + HEOS 3) can be grouped together for stereo L/R. -Web Control: Although this has been featured on non-HEOS networking models for many years, it was dropped on HEOS models beginning in 2016; however, will be reintroduced on 2018 and newer models, the X8500H via a firmware update sometime in 2019. 2. If the source will not pass 4k/60Hz HDR10: Set the "4k Signal Format" (p. 206 Owner's manual) setting to "Enhanced" from factory default of "Standard." 3. If TV will not accept HDR signal from the AVR: Enable the "enhanced" or "UHD" video mode for the TV input from the AVR (see below). 4. 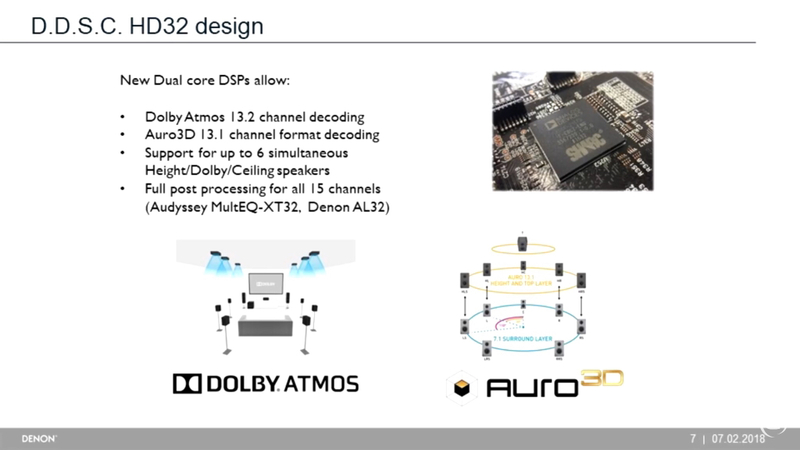 Dolby Atmos requires a minimum of a 5.1.2 setup while DTS:X/DTS Neural:X/Dolby Surround can use a 3.1.2 setup. 5. 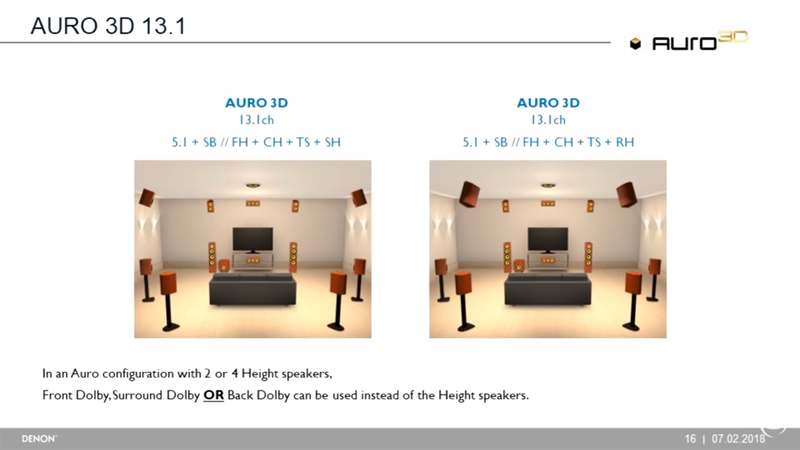 Regardless of where the height/overhead speakers are physically located, using a FH+RH (7.1.4) or FH+TM+RH (7.1.6) configuration will allow the FH+RH speakers to be used with all three 3D audio codecs: Atmos, DTS:X, Auro 3D. 6. 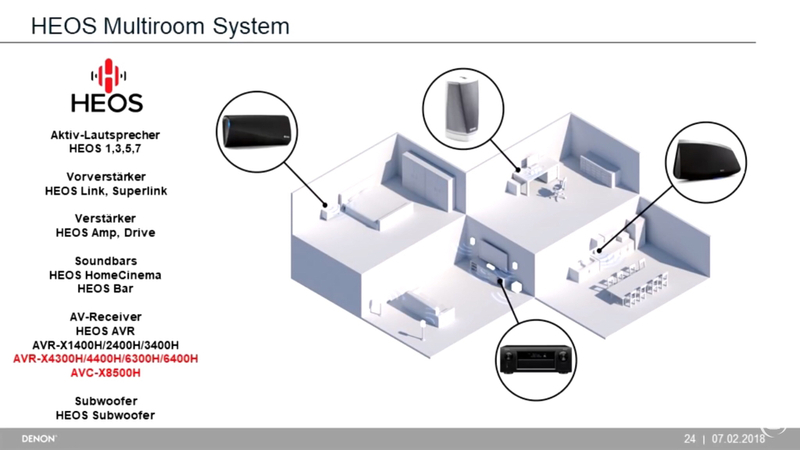 Although up to 15 speakers can be connected (for convenience), a maximum of 13 speakers can operate at one time (regardless of whether using external amps or not). 7. Although DTS:X and Neural:X are currently limited to only 11 speakers, DTS plans on passing an update to D+M in 2019 to allow the processing of 13 speakers. 8. Although there exists a DTS <Dialog Control> setting (p. 182 Owner's manual), the audio mixer must include this control in the audio (which has been rare) in order for the setting to be active (ie. display) under SETUP - AUDIO - SURROUND PARAMETER - Dialog Control when a DTS:X audio track is playing. 9. ISF DAY/NIGHT Custom settings: After selecting either PICTURE ADJUST - ISF DAY/NIGHT, press <Enter> to select the setting. Then press/hold the INFO button for 5 seconds at which point the same Custom settings as are available with the "PICTURE ADJUST - Custom" setting should be displayed with the only difference being that the "Gamma Coefficient" (although not displayed nor editable) is different for each of the ISF DAY/NIGHT settings. 10. When using an HD DVD player, set the Deep Color setting on the TV input to OFF. 11. DTS Neural:X cannot be used to process audio above 48kHz. 2. 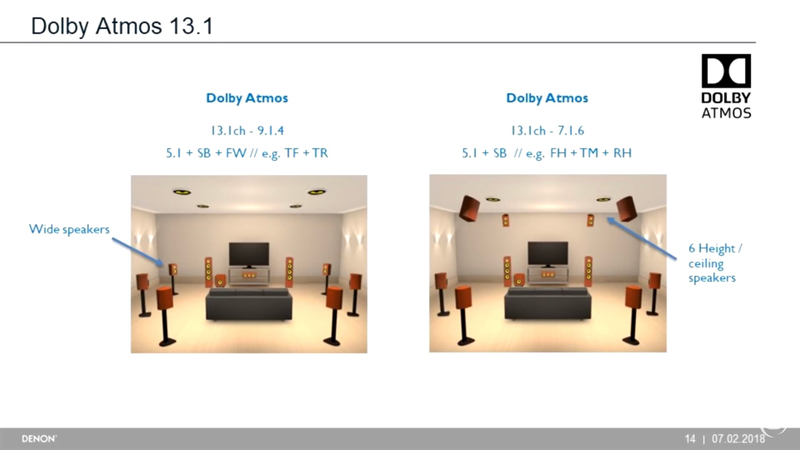 It is not possible to have 6 height speakers active when Front Wide are active with Atmos (TF+TM+TR) nor with the current DTS:X/Neural:X 11 speaker limitation. If you would like to receive a copy of the Auro 3D Demo Disc from Auro Technologies, although the disc itself is free, Auro Technologies will send you the disc for FREE if you pay shipping and handling. For Fedex shipment, handling and customs fees, pay 28 EUR (VAT included) onto bank account number BE07 3630 7852 4166 (BIC: BBRU BEBB). Please indicate a reference of the notification 'Dispatch Demo Disc/758'. Alternatively, payment via Paypal is also possible and upon your request via email to [email protected], Auro will send over a Paypal Payment Request. mtbdudex, flybob and Meyy Arunachalam like this. Last edited by jdsmoothie; 03-21-2019 at 07:02 AM. How do I reset the microprocessor or do a network reset? 1. "Restart" - set the AVR to Standby and press/hold the power ON button until "Restart" is displayed on the front panel. 2. Soft reset - set the AVR to Standby and unplug the power cord for about 10 minutes, then plug back in the power cord and turn ON. 3 - Simultaneously press/hold the "DIMMER" and ">" buttons for at least 3 seconds. 4 - Release your fingers when "Network Reset" is displayed on the front panel. 5 - "Complete" will display when the reset has completed. 3 - Remove your fingers from the two buttons when "Initialized" appears on the front panel display. 2 - Simultaneously press/hold the: "SETUP" and "DIMMER" buttons on the front panel and then press the ON/STANDBY button on the front panel. This procedure will take 15-20 minutes to restore to the original factory firmware. (1) Prior to resetting the microprocessor, you can SAVE the config/settings (to include Audyssey settings) to a USB thumb drive using the SETUP - GENERAL - SAVE & LOAD setting. Last edited by jdsmoothie; 08-13-2018 at 12:12 PM. (1) Firmware updates should be available via Denon's website and can be downloaded and installed via USB thumb drive. You will need to enter the serial number of the AVR at the website page to obtain the update. It may take a month or more after the firmware update is released via the internet to the AVR for it to appear on the website for download. (2) Firmware updates can also be installed by the owner via an internet connection to the Denon servers. Although it's not necessary to update your unit if you are not experiencing any problems, it's generally a good idea to keep it updated so that if there are any problems with the update the unit will still be covered under warranty. The update process generally doesn't take more than 30 minutes once the download begins and also generally does not erase any settings, although it's always a good idea to SAVE the config.avr file using the Setup - General - SAVE & LOAD - SAVE feature prior to doing the update just in case. Note that if the update process is stuck on "Authenticating", ensure a source other than NET/USB is selected and just let it continue for up to a few hours and it should eventually begin the update process (although note that Denon's servers have been known to crash the first day of release due to the overload, so you may want to wait a few days before trying again). Some have noted that rather than selecting the "Check for Update", instead simply selecting the "Start Update" will avoid the "Authenticating" issue. 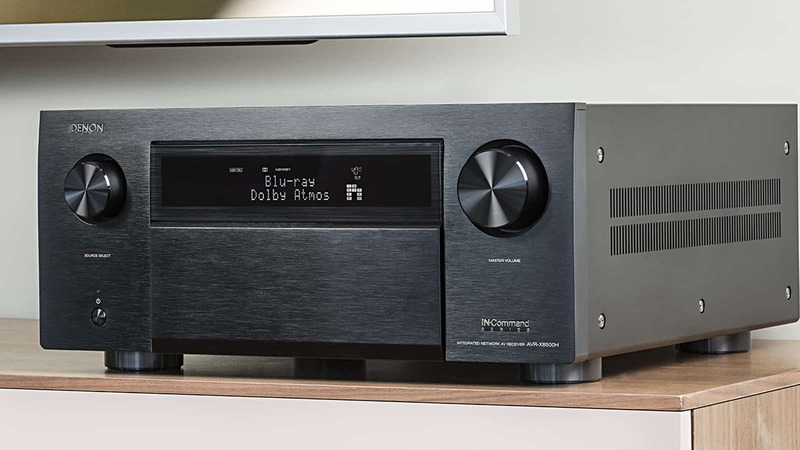 One prior model year owner found that disconnecting ALL sources to the AVR enabled the unit to connect to the Denon servers and update the firmware when the update process had previously been unsuccessful. Other tips if having problems with the update include setting "Network Control" to OFF in Standby, cycling the DHCP setting on the AVR, or using a static IP address. During the update, the AVR will go into Standby mode, but will continue to update status on the front panel display. If the update seems to be hung up (ie. goes beyond 1 hour) ... power the AVR to Standby, unplug it for a few minutes and power back on and attempt the update again. If the update fails to load, check the network environment (ie. reset the router, replace the router with a more current/robust model, or ideally wire directly to the router if connecting wirelessly) If still not having any luck with the update, perform a Network Reset as described in post 3 above. You may also want to consider purchasing a long (100'+) Cat5/6 cable for network updates only for a higher probability of a successful install. - Sometimes no grouping possible between some HEOS speakers. - After update, grouping of two HEOS products was no longer possible when Stereo grouped. mtbdudex, Manni01 and JamHandMan like this. Last edited by jdsmoothie; Yesterday at 08:42 PM. [edit 2/2] My 8500H was delivered Friday Feb, 2, 2018. I will have my own HT re-build thread, https://www.avsforum.com/forum/19-de...l#post55584676 , comments here will be specifically AVR X8500H related. Learning from Stuart add side1 for 7 bed + FW + Side1, hence 11 floor channels, the subs 2 different managed for location grouping plus tactile transducer on its special managed channel, then 10 ceilings for max Atmos. This post will be closure of the Wishlish thread, https://www.avsforum.com/forum/90-re...l#post29491946 , to this released / delivered thread. I have compiled the first 3 pages of the wishlist thread viewed here into a tracker and summarized the status of 50 wishes. It's a google doc web page, when updated it's live here, the pictures will get out-dated as updates to google doc are made. Of 50 items, 23 are yes and 27 no. let's not use this thread for a 2020/2021 X9500 flagship wishlist, that's too soon and worthy of another thread. [U]OK, I'm not going to do more than 7.1.4 Atmos. What else does this offer vs. the cheaper X6400H? The X8500H can do a vertical stretch for use with anamorphic lenses. I think a long video presentation is in order. 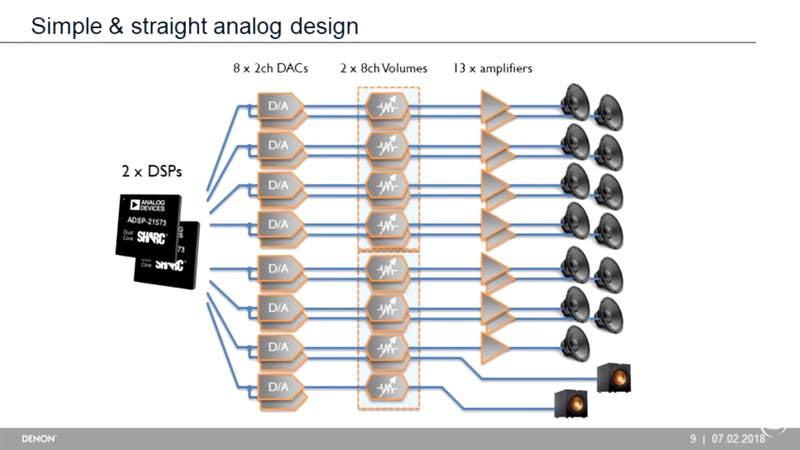 This diagram (pg 68 of the manual) shows the maximum layout to support 15 speaker connection with switching between two maxed out 13.1 layouts: 13.1ch Auro3D + 7.1.6 Atmos/DSU playback. When in Atmos/DSU playback mode, the output will be 7.1.6 (using Front Height + Top Middle + Rear Height). When in Auro3D playback mode, the output will be 13.1ch (using Front Height + Center Height + Rear Height + Top Surround). Note that you can drop the Top Middle speakers and instead reassign Height4 to the Front Wide output, which would allow a mixed layout with 13.1ch Auro3D + 9.1.4 Atmos (Front Height + Rear Height). mtbdudex, asoofi1 and Nalleh like this. Last edited by batpig; 01-25-2018 at 05:12 PM. Spizz, mtbdudex, tezster and 3 others like this. 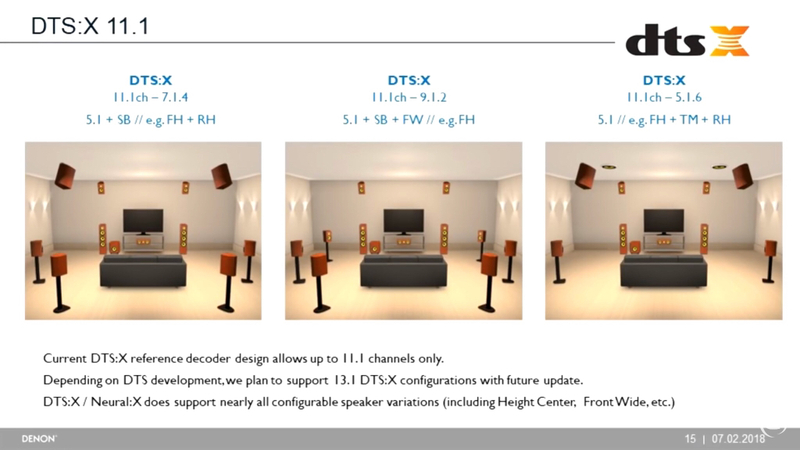 According to the manual, DTS:X/N:X in a 5.1 ear level setup should be able to utilize Top Surround(not in DTS:X)+ Center Height or Top Middle for a 5.1.6 setup. Dual Atmos Receivers - Atmos 13.1.8/DTS X 9.1.8/Auro 3D 13.1 - Denon AVCX8500H+AVRX7200WA - Klipsch+KEF - 4xSI-HT18v2 in 2xDO Sonos - 12x12" JBL GT-X1200 NF - 3x2 stacked Crowson MA - 4xBK-LFE - 6xNU6K(fan&trig mod) - Minidsp 10x10HD - Oppo UDP203 - XBox OneX - Apple TV4K - JVC RS600 Dreamscreen V2 120"- Philips 65OLED873 - Harmony Ultimate. Question about the series two HEOS speakers. They are Bluetooth, so can one access the speaker directly with an iPhone and iTunes? That would be without the Denon app. Q2 - If one had the app and a device ( iPhone, iPad ) could one use the speaker without the Denon AVR? 2. Yup, no AVR required. The iOS/Android HEOS App can stream to the HEOS speakers or to the AVR as the AVR is simply considered another HEOS speaker. I use my GS3 to stream Pandora to (2) HEOS 3 speakers (grouped as stereo L/R) in my office and to a HEOS 5 in my combined LR/DR/Kitchen for whole house audio when I walk between rooms. I also bring a HEOS 1 + Go Pack out to the patio for up to 6 hours of listening without having to plug it in when fully charged. Note however, the HEOS 1 is the only model that is both A/C powered and also can use a battery pack, while the other models 3/5/7 can only be plugged in to an A/C outlet. The built-in HEOS module in the AVR also adds the convenience of streaming 2CH audio to the HEOS speakers with the same limitation as passing audio to the Zone 2 speakers (ie. source must be PCM 2.0 from either HDMI/optical/digital coax/analog/network/internet radio/USB/Tuner). Also, although the app is initially required to stream audio to the AVR, once streamed, you can SAVE the station to the AVR's "HEOS Favorites" and then going forward you can select the station directly from the AVR rather than having to use the app again. And for those of you with Alexa enabled devices (eg. Echo, Echo Dot), although currently only capable of simple control (ie. ON/OFF/network source) of the AVR, with a soon to be released update, the HEOS Home Entertainment skill will enable more advanced control of the AVR to include selection and control of external devices. Manni01, runnernorth and vn800art like this. Last edited by jdsmoothie; 01-25-2018 at 08:53 PM. Last edited by jdsmoothie; 01-25-2018 at 09:18 PM. Yet another feature only readily accessible on the "flagship" models is the ability to change the Remote ID (p. 284 Owner's manual) when you are using another Denon AVR nearby the X8500H. Any idea if there's any benefit to upgrading to this from a x7200wa, in terms of hardware, dacs, amps etc? I might do it simply for the future HDMI 2.1 support but if I'm not going to gain anything now, I might as well wait until the 2.1 board comes standard. A lot of info to digest. Thanks. [*]The X8500H also has a "pre-amp mode" which disconnects the amp section. Can people hear a difference, and how will this be against a Marantz 7704 or 8805? Samsung 65"Q7FN, Sony UBP X800, Mede8er med600x3d, Nvidia Shield tv, Atv4k, Xbox One X, Hp htpc. Nad M17 , ATI AT543NC ,Nad M25. Arendal Sound tower, Arendal center, Arendal Surround, Arendal sub 2, Dali Oberon On-wall, Dali Alteco C-1. Yup. Released this week so shipping from Denon and and West Coast dealers this week and East Coast dealers next week. I would only upgrade from the X7200WA if you were going to take advantage of the 13ch capability. The DAC's are the same and, while there may be some incremental improvements in other areas (e.g. 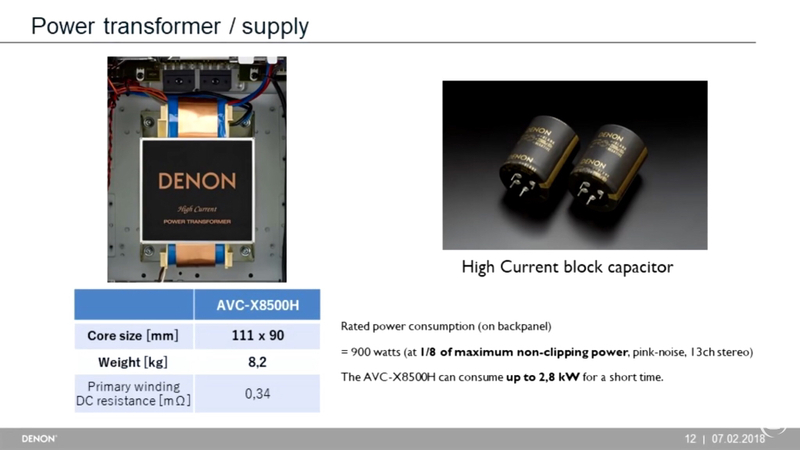 power supply), I doubt you'll hear a major difference between the two models. If you're not going to go beyond 7.1.4 (or utilize the expanded Auro3D layout) then I don't think the incremental upgrades are worth it unless you REALLY want to integrate the built-in HEOS into a whole home audio system. 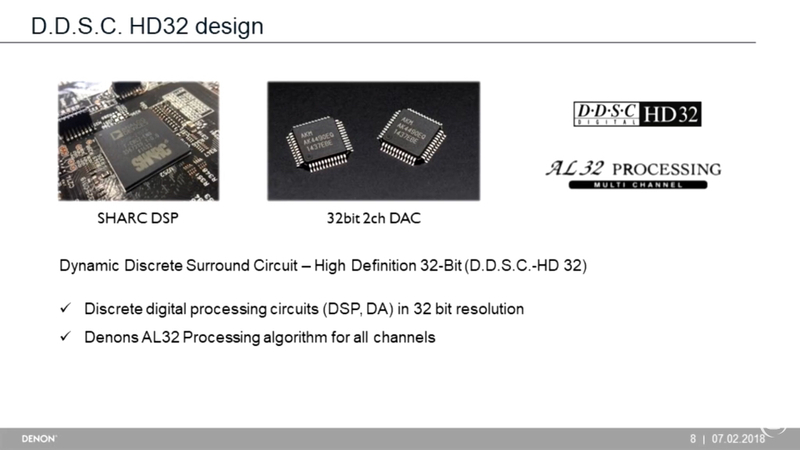 HDMI 2.1 isn't relevant yet as by all accounts it's over a year away from being ready on the hardware side (let alone there not being any 8k content to utilize it). Lesmor, asoofi1 and krismate like this. This isn't really a new feature, as it was available on previous models like the X7200W and 4520CI. To be honest, I consider it essentially a marketing gimmick with dubious real world benefits. The amps are disconnected from the signal input but they aren't "turned off", they just sit there idling with no signal. So maybe there's some tiny incremental benefit in from disconnecting them. But I wouldn't make my decision based on this feature. 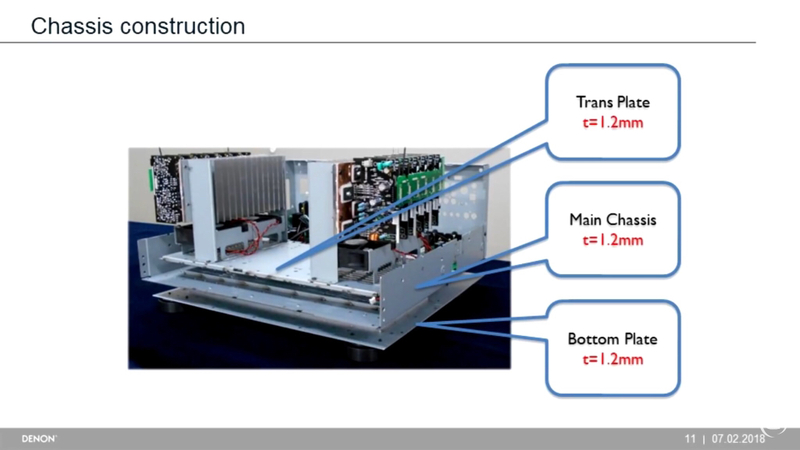 Personally, if you're looking for a cheaper inroad into separates, I'd rather use the "free amps" in the unit to power the less important channels (e.g. overheads, back surrounds) and get better amps for the more important channels. This hybrid approach where you use some receiver amps + some separate amps is a lot better value. chi_guy50, Alanlee and sveineb like this. So does this give more power to the other amps...? Geez, you guys are impatient! Unfortunately, didn't have time/energy to set up last night after a long day of work and then getting the kiddos to bed. I'm going to hook up and play around this weekend though, so stay tuned! Jive Turkey, Nalleh and vn800art like this. Yes. The fewer internal amps that are used provides more available power to speakers connected to the speaker posts. OMG, and you call yourself an enthusiast! Kidding of course...looking forward to the updates this weekend. Well, right - isn't that how all receivers work? What does this Denon "feature" actually do that is different? Simply shunts the signal from getting to the amps. Does Denon have different front fascias for different markets? Various pictures of the 8500 look different - one shows it with silver badging - others show it with gold badging and that INCommand badge. Correct. Although all of the Denon USA "X" series models show the "InCommand" badge, in other regions (eg. UK, AU) they don't display it. Last edited by jdsmoothie; 01-26-2018 at 12:14 PM.